In an emergency, call an ambulance by dialling 111. For information about what to do next, see Asthma emergency. Many people put up with asthma symptoms when they don't need to. Asthma is treatable. You and your healthcare team should be able to agree on a treatment plan that will control your asthma (see the self-management plans on Living with asthma). If you're using your reliever inhaler more than three times a week, this is a sign that your asthma is not well controlled. If you're using your inhalers as agreed with your doctor and you're still having symptoms, it is important to discuss this with your doctor to find out why. Adults with asthma are usually given inhalers as part of their treatment. There are several different types of inhaler. The types are usually divided up into relievers and preventers. Relievers relieve symptoms and preventers stop the symptoms happening. The colours of inhalers have changed recently. Doctors now prefer to call the inhalers by their names rather than their colours. The inhalers page has a link to a poster showing the inhalers that are available in New Zealand. Talk to your GP if you aren't sure which types of inhaler you have or if you are having problems using them. Some people forget to use their preventer inhaler regularly. If you find you aren't taking it as often as agreed, talk to your GP. You may be able to agree on a different way of taking your inhalers (see Single inhaler therapy below). If you have asthma, you should have a reliever to use when you feel wheezy or short of breath. Short-acting relievers manage your symptoms quickly by relaxing the muscles in your airways, opening them up to allow more air to flow. Examples of short-acting relievers include salbutamol (Respigen or Ventolin) and terbutaline (Bricanyl). If you are using your reliever more than three times a week, you may need a preventer inhaler as well. One reason for this is that your body may get used to the reliever medication so it no longer works as well. Preventers reduce the inflammation in your airways. Unlike relievers, preventers don't make you feel better straight away. But if you use them every day they make your asthma symptoms less likely to occur. These preventers are usually mild steroids. Examples of steroid preventers include beclometasone and fluticasone. Long-acting relievers help to keep your airways relaxed and open. You usually take these medications when your preventer inhaler is not enough to keep your asthma under control. If you need a long-acting reliever, you will take it as part of a combination inhaler. Combination inhalers contain both a long-acting reliever and a steroid preventer. Examples of these medications include salmeterol plus fluticasone (Seretide or Rexair), formoterol plus budesonide (Symbicort or Vannair), and vilanterol plus fluticasone (Breo). 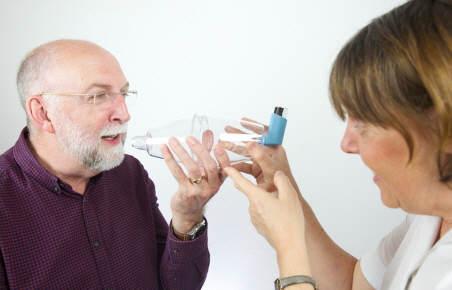 Single inhaler therapy is a fairly new approach but it is becoming more and more popular. With single inhaler therapy, some combination inhalers can be used both as a reliever and a preventer. The main advantage of this is convenience of use. Also, whenever you need more reliever, you'll automatically get more preventer. You use this inhaler every day, but also when you need quick relief if you feel wheezy or short of breath. Symbicort and Vannair are the only combination inhalers in New Zealand that can be used in this way. Other combination inhalers such as Seretide, Breo and Rexair should not be used as single inhaler therapy. If you have a very bad asthma flare-up or attack, and inhalers alone are not working, you may need a short course of steroid tablets. For adults the course is usually at least five days. The most commonly used steroid is prednisone. Like the inhaled steroid preventer, prednisone reduces inflammation in your airways. Many people have a written, agreed plan for when to start prednisone, and have a supply at home (see the self-management plans on Living with asthma). Some people with asthma take a medicine called montelukast. This can be especially useful for exercise-induced asthma or asthma related to sinus disease, that isn't responding well to inhalers. Montelukast has a rare but important side effect. People have been known to become very depressed while taking it. If you are taking montelukast and think your mood is affected, it is very important to stop the drug and see your doctor straight away. For most people, stopping the drug quickly brings their mood back to normal. Nebulisers are sometimes used in hospital for severe asthma attacks. A nebuliser is a machine that has an air compressor and a breathing mask. You put liquid reliever medication into a container and the nebuliser produces a fine mist that you breathe in through the mask. Most people with asthma don't need a nebuliser at home if they are using their inhalers properly. Information about preventer medication, reliever medication, symptom controllers, combination inhalers, and prednisone.